In the years gone by, if you saw a lowercase letter i in the branding of your BMW, you knew one thing: this meant that it had a petrol engine, as opposed to a little d, which indicated that you were driving a diesel. Not any more. Now, you have to look carefully and note where the i is placed. If the i goes after a set of three digits, then it’s the i we’ve all come to trust over the last century – yes the very first BMW car was built in 1923, nearly 100 years ago. However, if the i goes before a single number or is part of the marque (i.e. BMWi), then it indicates something else altogether. Every single BMW with this sort of i is an electric vehicle. It’s puzzling to know what to call the cars with this type of i designation – BMW officially calls it the i series, but it does overlap with the more traditional series names; for example, the i3 is a member of the i series and a member of the 3 series at the same time while the i8 is part of the i series and the 8 series. The i series is BMW’s plunge into electric motoring and turns away from the use of fossil fuels (OK, some fossil fuels may be used to generate the electricity, but that’s another story and it’s possible to generate electricity using sustainable and renewable sources). The new i3 is a purely electric vehicle (unless you get the variant with the range extender, which has the happy name i3 REX and is a hybrid) whereas the i8 is a hybrid that uses a petrol engine in combination with the i’s signature electric motor. Describing electric motors can be tricky, as we’re not as familiar with the technology as we are with diesel and petrol – we know that a petrol engine with turbocharging and lots of cylinders is going to be quite grunty. But it’s less obvious that a 360-volt DC engine is going to have a lot of kick – but it does and that’s what you find inside the i3 and the i3 REX. The power and torque and all the other specs like the 0–100 km/h time are still the same as the ones we’re used to, as these refer to speed and motion and acceleration. In the i3, you get 125 kW and 250 Nm that take you from a standstill to 100 km/h in 7.3 seconds; the i3 REX has the same power and torque but can do the sprint in 8.1 seconds, possibly because of the extra weight involved. In the i8, the 226 kW and 570 Nm get you flying at 100 km/h in a mere 4.4 seconds, which gives the rarer sports electric Teslas a good run for their money. Naturally, the i series electric and hybrid vehicles have way better fuel economy than their full-fuel stablemates from BMW. For example, in the official specs brochure, the i3 has a blank where the L/100 km stats ought to be. The i3 REX has an official combined fuel consumption figure of 0.6 L/100 km and the hybrid i8 does the job on 2.1 L/100 km. Naturally, the emissions stats are equally low. The way to evaluate electric and hybrid engines for their “fuel economy” is to look at their range. 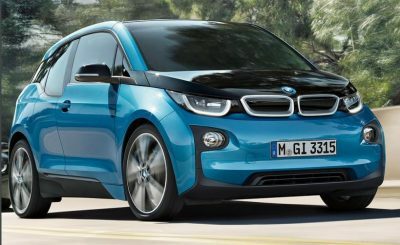 The pure electric i3 has a range of 245 km maximum, while the i3 REX with the range extender can go for up to 370 km. The hybrid i8 can roll on for 600 km maximum; of course, this depends on how you drive, of course, just like the official fuel consumption figures. Speaking of driving range, it’s easier to recharge your BMWi than you think. You have the option of charging at one of the many public charging stations or using the BMW i WallBox while you’re at home – and that’s something that you can’t do with a traditionally fuelled vehicle! With the i3, it takes 4 hours – less time than you spend in the office in a typical working day – to get to 80% battery charge; in the i8, it takes 1 hour and 45 minutes. Features like brake energy regeneration to transform the kinetic energy of motion into electric potential energy. Carbon fibre technology does its bit to keep the weight down and has the added advantage of being easy to mould into all kinds of smart styles, whether it’s the sleek looks of the i8 or the chunky urban verve of the i3. The same goes for LED lighting inside and out: they use way less energy than the old incandescent or fluorescent bulbs did/do and because of their size, they’re fun for the designers to play with – and I have to say that the ability to select different colours of ambient lighting in the interior is very nice. Motoring in any of the BMWi offerings is silent or at least very close to silent, as electric motors don’t involve the controlled explosion of an internal combustion engine. This means two things. Firstly, the range of safety features (and there are plenty of them, including the dynamic stability control package) has to include the Acoustic Pedestrian Protection system, which emits a delicate but clearly audible warning when travelling at speeds up to 30 km/h so that people crossing the road or walking through the parking lot can hear you coming and won’t walk into you. The Driving Assistant will help you know if they’re coming and it will also detect imminent forward collisions and take appropriate measures. Secondly, with a quiet engine, you probably want a good sound system so you’ve got something to listen to. In the i3, you get a 100-W sound system pumping through four speakers that can take any modern type of input you can think of (USB stick, MP3 player or iPod); in the i8, you get something else again in the form of an eleven-speaker surround sound system that is better than what I’ve got in my living room. For more information on the individual specs and features of the i3 and the i8, please go to the separate reviews to find out more. All of the BMW i series line-up are designed for urban driving only, at least at this stage. However, as the years go by and electric motoring technology improves as demand increases, we’re sure that we’ll see new offerings that are capable of going further and heading out into the country. Watch this space! For any more information on the BMW i, or for that matter any other new car, contact one of our friendly consultants on 1300 303 181. If you’d like some fleet discount pricing (yes even for private buyers! ), we can submit vehicle quotes requests out to our national network of BMW dealers and come back with pricing within 24 hours. Private Fleet – car buying made easy!